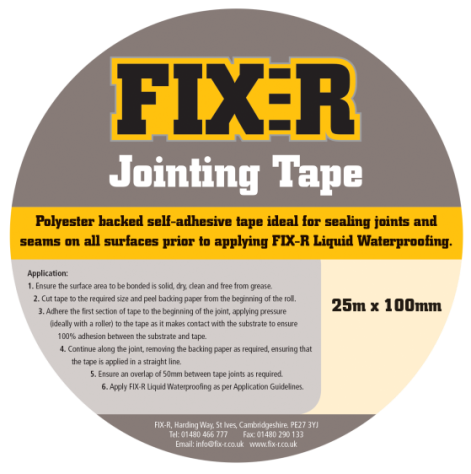 FIX-R Jointing Tape is the latest addition to FIX-R’s Liquid Waterproofing range. FIX-R Jointing Tape is a polyester reinforced self-adhesive tape designed to seal joints and seams on all surfaces prior to the application of the accompanying FIX-R Liquid Waterproofing system. Replacing the need for the 100mm wide reinforcing fabric and liquid application previously used at these joints, FIX-R Jointing Tape saves you time on installation, as well as reduces your overall material costs. The easy peel-off backing makes application as simple as possible. Available at all SIG Roofing branches, nationwide, FIX-R Jointing Tape turns the tricky jobs into quicker jobs!